The food is SO bad here they must make sure you clean up after dying! *angry chinese voice* You die on table? You no clean table? 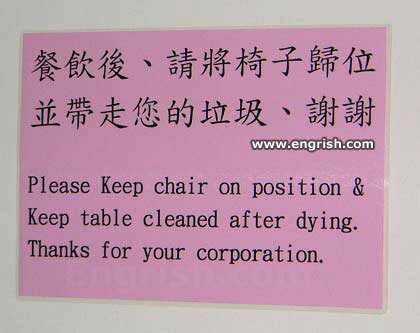 We study necromancy and brin you back to life, then you clean table! Then we take you outside and let you die! This place is FILLED with corporate zombies!!! HARAKIRI FOR EXECS 101, MAYBE? “HEY WAITER!” gimme a gun would ya? dang it….my towels gonna get red…. People do not live long at this cafe eh? Don’t worry, once I’m dead the chair won’t move an inch. I’m dying to try this place. Sorry, I forgot my knife! Cafeteria Worker: Hey, you! Clean up your mess and put your tray away! how do i clean the table, IF I’M DEAD?!? !